Yesterday was a fetch day. I needed parts for the riding lawnmower and some things for the garden. Unfortunately, these items do not exist in the same place, so I spent a good deal of time on the road. I decided the back road would be the best route home so when I'd rounded everything up, I steered the truck toward the roads less taken. 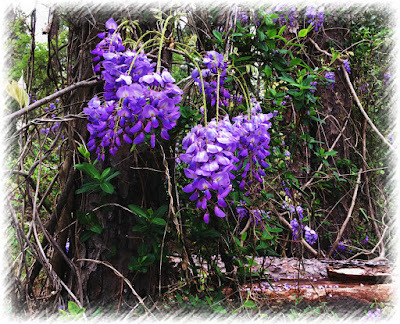 Out in the middle of nowhere, a jungle of wisteria sprang up and was hanging from the limbs of oak and pine. The wisteria blossoms looked like purple grapes. Pulling over to the side of the road, I stepped out to get a better look. There were photo ops in every direction, and I had trouble deciding, so I picked a few angles and snapped away. When I stepped back into my truck, I flipped through the pictures and smiled. I thought as I signaled and pulled back onto the pavement, this is why I love taking the back roads. Purple grapes indeed! Walked beneath an arbor of wisteria--magical! How lucky to have wisterias growing wild in your area. They are a beautiful sight when all in bloom. Wisteria, I was introduced to that in Jan Karon's 'Mitford Series' of Novels. I had NEVER paid any attention to Wisteria. But Jan writes a lot like you, she can draw the reader in. I could almost smell the stuff and Sherry had to start pointing it out to me. It is a beautiful and smellful vine! Good picture. Love the roads less traveled. Magnificent color. Thanks for sharing. I really do like New Jersey, but we seldom get photo opportunities driving to the strip mall. Beautiful! We have many back roads here too but nothing as pretty as that will be around for a few months. After tonight's snow storm I'm hoping I'll see color from my lilacs and other flowering bushes! Brrrrr! The wisteria is beautiful and back roads are the best! I like to travel them when ever possible. It may take more time to get to where I want to go, but it's definitely worth it. All of spring blooms are now covered in snow. Spring doesn't always feel like Spring here in northern Ohio. I've always loved wisteria. Such an attractive flower. Used to see a lot of it when we lived in North Carolina. I love this flower and it looks so beautiful in gardens. I wish they lasted all summer. Yesterday, we got snow and more today.....I actually thought of you with these beautiful picks and took a pic of our bare blah bush surrounded by snow. Yours is much nicer. A beautiful picture; as usual!! I often go driving wherever the steering wheel takes me. It is fun to see what I find. I love the back roads too! Beautiful photo!